Filter products by Price, Manufacturers, Opencart filter, Stock status. 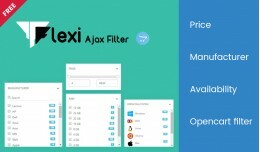 Very advanced, lightweight and automate filter. Licence for Theme developer The developer can distribute the free version of this filter with their theme as per the..